C.C. is apparently immortal, healing from any wound (implied to include beheading) with enough time. She also doesn't age. Apart from her immortality, C.C. has the ability to bestow people with the power of Geass, which manifests differently in each person but generally carries the ability to affect the minds of those it is used on in some way. The Geass sigil glows on her forehead whenever she manifests this power, and she has a similar scar on her left breast. It is hinted that many more like her exist, as shown in her memories of many children with similar sigils, and she suggests that the power has precipitated bloody conflicts in the past. Her powers caught the interest of Britannia, who imprisoned her for experimentation purposes. 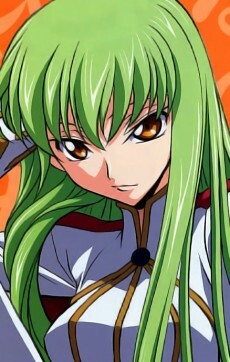 Before she gained the power of Geass, C.C. was a ten-year old escaped slave. A church nun gave C.C. the power of Geass, making everyone around her fall in love with her. Once C.C. 's power evolved to its highest point and she grew tired of all the proposals and gifts, the nun transferred her immortality to C.C., allowing her to die while leaving C.C. in the position of repeating the cycle. In the first season finale, C.C. triggers a trap set by V.V., causing herself and Lelouch to be submerged in a shock image sequence similar to the one she used on Suzaku. Through this, Lelouch sees memories of her past, including repeated "deaths". One shows C.C. attempting to escape from a battlefield, only to be shot in the forehead. Further memories show her being persecuted as a witch and suffering various forms of torture and/or execution throughout history and various time periods, including burning at the stake, guillotining, and the iron maiden. This would suggest a minimum lifespan of at least six centuries. In a special feature included in the series' fifth DVD, she and Lelouch discuss Washington's Rebellion, during which she speaks of participants such as George Washington and Benjamin Franklin as if she had been close friends with both. In the past, she appears to have observed Suzaku and Lelouch when they were both children, having even interacted with Lelouch at one point, though he doesn't remember their meeting. Her individual experiences have led C.C. to become a detached and lonely individual, with little care for even those she has entered into contracts with, while in the past she was somewhat a spoiled and cheerful girl. She tells Lelouch that she has been alive so long that she can no longer remember who loves her and who hates her. Due to her nature and history, she has been lonely as long as she can remember. Lelouch replies, "You're not alone. We are partners. If you are a witch, then I shall become a warlock." Lelouch is possibly the first person that has ever truly cared for her and it appears that she reciprocates at least some of these feelings, as she unexpectedly kisses him after their memories are shared. C.C. has a strong penchant for pizza, especially Pizza Hut's (which sponsors the show in Japan, though the logo is blurred out in the English dub); she constantly orders pizzas to Lelouch's house using his credit card. She also carries around a stuffed toy of "Cheese-kun", the company's mascot in Japan. Her love of pizza is often used for comedic effect, as she was twice willing to risk capture simply to get a piece of a giant pizza being made by the Student Council (which is ruined both times); she doesn't trust Lelouch to retrieve it for her. Both Lelouch and Kallen sometimes refer to her as "Pizza Girl". When left alone, she has sometimes spoken to a previously unknown person through means unknown, which, in episode 23, was revealed to be Marianne, Lelouch's deceased mother, although in episode 19 it appears that she is talking to V.V. as well. According to the DVD Magazine 02, she is talking to more than one person when she seems to be talking to herself. In the past, it was shown that she and Marianne were close.